In recent times, there has been an emergence of conventional research approaches supplemented by new science and intermediate technology to resolve current challenges in agriculture like declining farm profitability, reduction in natural resources, resurgence of the new pest and diseases, global warming, rising population, and climate change. Major chemical companies are now trying to make potential pesticides at nanoscale as nanopesticides to increase the effectiveness of pesticides. Nanoencapsulation is a potent carrier for carrying these nanopesticides to the target position. One of the most efficient nanomaterial is aluminosilicate nanotube. The spread of aluminosilicate nanotubes on plant surface is taken up by insect hairs. Insects consume pesticide-filled nanotubes and get killed. The nanoparticles are also used to prepare the strain-resistant plants and eco-friendly pesticide development. Silicon nanoparticles are absorbed by plants, and they lead to increased disease and stress resistance. Nanoparticles not only play a crucial role in killing of pathogens but also its early detection through the application of nanobiosensor. Another area where nanotechnology has shown promising result is delivery of DNA into plant cells to alter the expression profile of plants. Mesoporous silica nanoparticle has ability to deliver DNA and drugs into plant. Nanohomeopathic drug can significantly increase plant growth, chlorophyll, and water content of the leaves as compared to untreated plants. 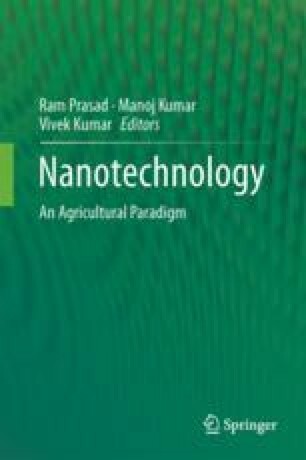 The application of nanotechnology in agriculture ranges from crop production to protection of produced crop against insects and other pests. Nanoparticles have shown to have profound implication on entomology, for example, the insecticidal activity of stored grain pests because of loaded nanoformulated allelochemicals. Some common examples of nanoparticles having antimicrobial effect are silver nanoparticles and TiO2 nanoparticles. Hence, an early embracing of this nanotechnological feat will have major say in ameliorating the worsening condition of food scarcity of ever-increasing population. Manish Kumar and Tooba Naz Shamsi contributed equally to this work. We sincerely thank DBT, India, for fellowship and Dr. Rakesh Khatri, NCBS, Bangalore, India for thei valuable suggestions and fruitful discussion on related subject.